Last year, Chris Borland of the San Francisco 49ers announced he was quitting American football because of the high risk of concussion and long-term brain damage, despite protective helmets. And he’s not alone: it’s a growing concern, particularly for teenage athletes. But a new collar inspired by the humble woodpecker may help protect athletes from such trauma in the future . Invented by David Smith and Greg Myer of the Cincinnati Children’s Hospital, the “Q Collar” creates a kind of bubble wrap around the brain. It was the subject of two new studies published last week in Frontiers in Neurology and the British Journal of Sports Medicine, demonstrating significant decreases in signs of brain trauma in high school football and hockey players. More than 60 per cent of NFL players have had at least one concussion, and may suffer long-term brain damage as a result. Helmets protect them from skull fractures, but do very little to stave off concussion and related brain trauma, because that extra padding just increases the inertia, according to Myer. That makes injury more likely, because the brain can slosh around inside the skull cavity, potentially damaging brain tissue and vital neural connections. Yet they don’t suffer concussions because their heads serve as natural shock absorbers. 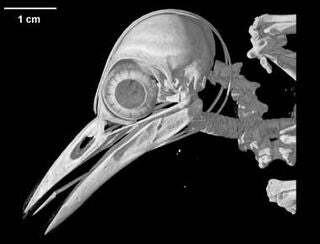 Past studies involving CT scans showed that woodpeckers have thick muscles, spongy bones, and a third inner eyelid, all of which combine with the cerebrospinal fluid to help absorb the impact of all that frenzied pecking. Woodpeckers also have a long tongue that can wrap around the head and pinch the jugular vein. This actually increases blood volume in the skull, creating a protective cushion—adding extra padding on the inside rather than outside of the skull. The mechanics of that unusual tongue reminded Smith of an old military diagnostic test for spinal damage from the 1920s, whereby doctors would pinch the jugular vein of a patient to see if it created a corresponding increase in pressure further down the spinal column. If it didn’t, this was strong evidence of spinal injury. Smith was sure he was onto something and began emailing Myer about his hypothesis. Myer admitted he was sceptical at first—“It is crazy sounding!” he told Gizmodo—but then he realised it made perfect sense from a physics perspective. And there was a way to test Smith’s idea, inspired by another animal that seems to have a natural protection from head-injury: head-ramming sheep, who migrate to higher altitudes. Smith and Myer looked up all the data on head injuries among high school and professional football players and sorted it by the altitude of the various stadiums. They found a 30 per cent decrease in concussion for high school players and a 32 per cent reduction for NFL players at higher altitudes. Ironically, Denver—the so-called Mile High City—didn’t have the lowest rates of concussion. Myer said it’s because visiting players actually take supplemental oxygen between plays, reducing the positive protective effects of high altitude. But how could they mimic this effect in an actual device? That’s where a company called Q30 Innovations comes in. There had been prior studies with rats wearing collar devices that showed significant protective benefits to the brain. That’s what led to the design of the Q Collar, a C-shaped device that fits around the neck. 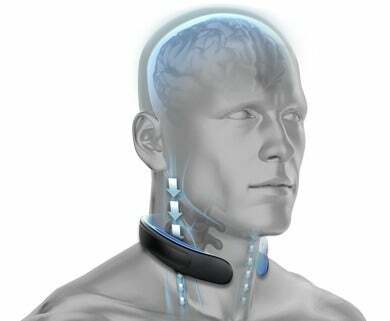 The Q collar gently clamps down on the jugular vein, putting a “kink in the hose” to increase the amount of blood in the brain. So there is less room for the brain to slosh around, and less risk of traumatic brain injury. The effect is similar to padding the brain on the inside with bubble wrap. But does it work? The two new studies published last week suggest it does. One followed hockey players, while the other followed high school football players, monitoring head impacts with sensors attached to the helmets. The players’ brains were scanned before and after the season using diffusion tensor imaging, a form of MRI, to look for structural markers of damage to the brain’s white matter. Players who wore the collar showed no significant signs of brain injury, compared to players who did not wear the collar.